John Coltrane’s musical career only spans 12 years between 1955 (the moment he first got noticed as a sideman) and 1967 (the year of his death). Despite his short-lived career, John Coltrane was one of the most influential improvisers in jazz and there is a lot to be learned from his musical legacy, also by guitarists. In this lesson, you will learn some classic John Coltrane licks, as well as some typical chord substitutions over a blues. Coltrane played in Miles Davis’ band from 1955 to 1957. The second half of 1957 he played with Thelonious Monk, before joining Miles Davis’ band again in 1958. This time he stayed till 1960 and played on 2 important Miles Davis albums: Milestones and Kind of Blue. In that period he also recorded two influential albums of his own: Blue Train and Giant Steps. 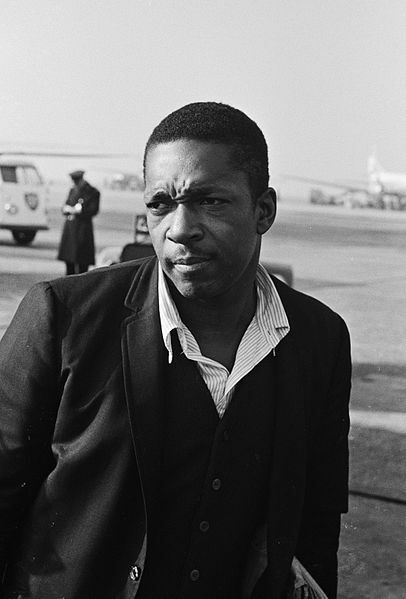 After his time with Miles Davis, John Coltrane picked up the soprano saxophone and formed a quartet with pianist McCoy Tyner, bassist Jimmy Garrison, and drummer Elvin Jones, with whom he recorded spiritually driven albums such as A Love Supreme. In this period he was influenced by the modal music of Miles Davis and the music of Ravi Shankar. In his last years, Coltrane got interested in the free jazz of Ornette Coleman. The first thing to notice is the half-step approaches to the G7 chord tones in the first bar of the lick. 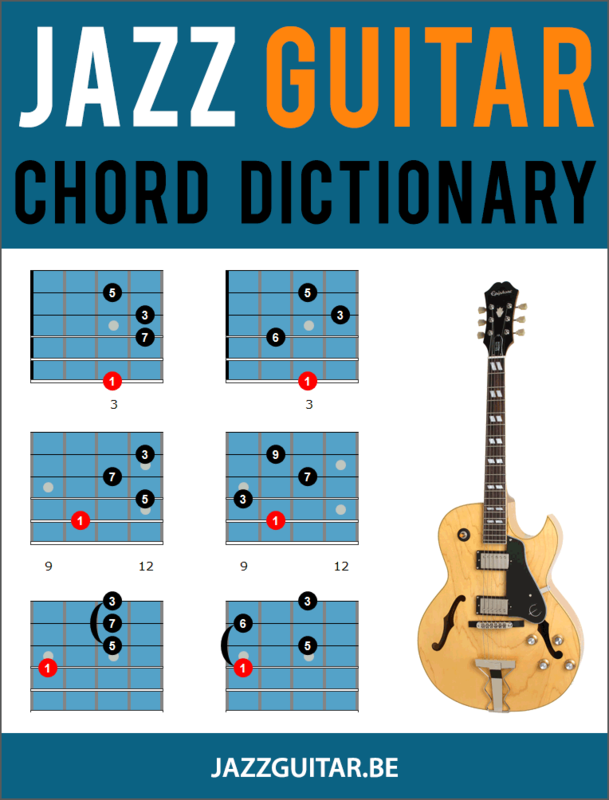 Each chord tone (F-D), is approached by a half-step above, creating the line B-Gb-F-Eb-D, and is something that you should apply to other arpeggios on the guitar. Playing a m7 arpeggio from the 5th of a minor chord is a great way to spice up these chords. As well, there is a bebop scale being played in the second bar as there is an added passing tone between G and F over the G7 chord. The bebop scale is an important Coltrane technique to check out in order to bring a Trane vibe to your solos and lines. There is an ascending scale running from the E all the way to A above the staff over the first two bars of the lick. The F triad used in bar 3 is something Trane liked to do, playing a second inversion of the triad, 5-1-3, instead of just running these chords tones in note order. Playing 4-5-6-9-1 (the last 5 notes of the line), are a very characteristic sounding Trane idea that you can add to your jazz guitar playing. This lick uses chromatic notes to bring a tension-release vibe. The 4ths that start bar 2 (D-G and G#-C#), are idiomatic to Coltrane’s lines as these outside notes then resolve to the A-C interval in the second half of that bar. The Bb-Db-C enclosure in the 3rd bar of the lick is something that John Coltrane loved to play and is a technique you can explore further in order to expand your knowledge of enclosures. This lick uses several superimposed chords to bring out different colors and tensions throughout the line. The second superimposed chord is the B6 chord in the second half of the 3rd bar, which is a tritone away from the underlying root chord (Fmaj7). Playing jazz blues tunes is something that many guitarists love to do. While soloing over the jazz blues chord changes can be fun and engaging for both performer and listener, there comes a point where we want to take our playing to the next level by adding in chord substitutions, creating a sense of tension and release in our lines and comping phrases. This section will explore a chord substitution approach that many players use in their solos and chord work, and one that was a favorite of jazz sax legend John Coltrane. As you can see, there’s not much going on harmonically in these measures, and so as a comper or soloist, you can use chord substitutions to raise the energy level and bring a deeper sense of harmonic interest to the first four bars of the blues. One of the subs that John Coltrane liked to use was to ascend in whole steps from I7, to II7, to III7, to #IV7, before finally resolving to the IV7 chord in bar 5 of the tune. As you can see, each bar creates a stronger sense of tension as you rise up the chords, which are finally resolved to the Bb7 chord (IV7) in bar 5. When applying these chord substitutions to your solos, you don’t want the rest of the band to follow you harmonically. If they do, you will lose the sense of tension that you build when running these subs over the blues. So, when practicing these chord substitutions, use a backing track so that you get used to hearing F7-G7-A7-B7 played over a static F7 chord, which is probably what will happen in the real world. Now that you understand the theory behind these chord subs, let’s take a look at an arpeggio exercise that you can use to get your fingers and ears around these subs. Start by playing the exercise below as written at a slow tempo, and use a backing track rather than a metronome if possible so that you can hear how these subs sound against the original harmony. From there, start to improvise over the changes using these arpeggios as the basis for your lines, outlining the chords in your lines but with a greater sense of creativity than just running up and down each shape. When you have these shapes under your fingers, try running other arpeggio shapes on the fretboard over these chords, as well as work 9th arpeggios, 11th and 13th arpeggios, and scales such as Mixolydian and dominant bebop over each chord in the progression. Once you’ve checked out arpeggios, scales, and other melodic patterns over these blues subs, you can also practice running motives across these changes. To do so, you simply play a riff or lick over the F7 chord in bar one of the phrase. Then, you repeat this lick over each chord as you ascend the changes and resolve your phrase over the Bb7 chord in bar 5 of the tune. Here is an example of that approach in action. Start by learning this pattern exactly as written, and then begin to change the rhythms as you ascend the chord changes to bring a bit of variety into the line. You can also apply these cool-sounding substitutions to your comping, especially when playing with familiar musicians that you know will hear what you are doing and react accordingly. You can also try and bust out these subs when comping behind a soloist if you want to inspire them to take the energy up a notch or to add a bit of an “outside” sound to their solo if they are playing fairly diatonically. As well, you can use these subs in your chord soloing and chord melody lines as you bring a bit of harmonic alteration to a chord soloing situation. Descend in whole steps from I7, to bVII7, to bVI7, to #IV7, and eventually land on IV7. As you can see, the further you go into the subs, the more tension you are creating over the original chord, which is then finally resolved into the IV7 chord in bar five of the tune. For now, try playing these chords on the guitar with a backing track, to hear how they sound. Then, when you’ve got your head and ears around the basics of these subs, move on to the next section where you will learn some soloing ideas that you can use to outline these chords in your soloing ideas. One of the most direct ways to outline and learn any new set of chord subs is to get to the heart of things and use arpeggios. Here is an example of using ascending arpeggios to outline these subs over an F blues. Once you get the hang of this approach, try using any other arpeggio fingerings you know, alter the rhythm for more variation, and check out the arpeggio variations below. If you want to dig a bit further into these subs (and the tempo dictates it), you can add in a V7 chord for each sub during these four bars. This was something Trane liked to do in his playing, but it can be tough as you are now playing two chords in each bar rather than one. Here is a sample of how you can use arpeggios to outline these chords. 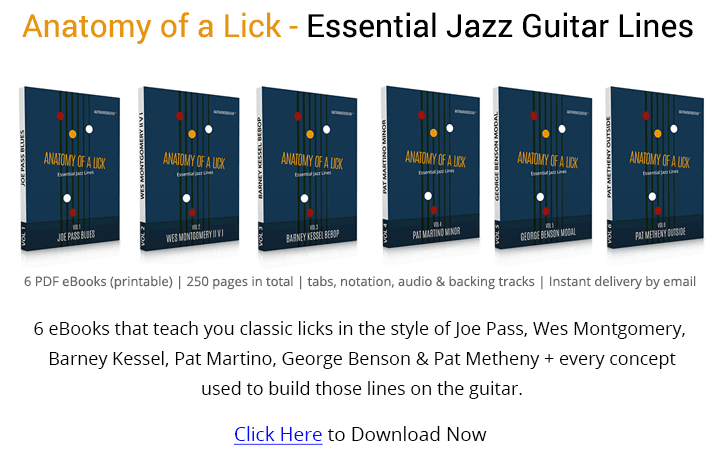 These daily Jazz Guitar lessons are a highlight of my day. Thank you. How would this last progression ( subs 3) continue? The last progression would resolve down by a half step to xx101011x over Bb7 and then you would go back to a normal blues progression from that point forward. Dear Matt. Thanks for the great lesson. Can you give an example of a recording on which John Coltrane used this idea? Sure, check out Take the Coltrane from his record with Ellington. About half-way through he uses a variation of this pattern. Excellent! I have that LP so I’ll go have a listen now and see if I can spot it! Thanks! 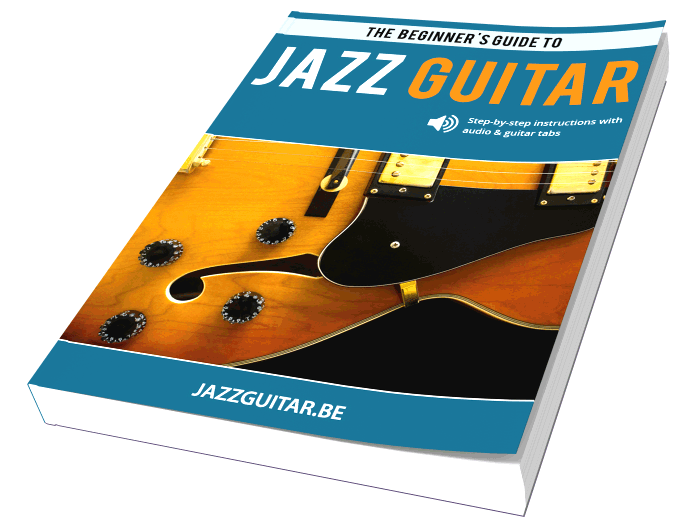 As a newcomer to jazz guitar playing and and as one who thought it was far beyond them to comprehend it I have learned so much from these lessons – Many thanks! This format (ie brief text, audio and notation) is exactly suitable. Thanks for having no video as these normally involve software, download and capacity issues which obstruct enjoyment and learning. Would you put simple melodies on these types of chords – analogous to the way folk cliche of playing a top g, f#, e and f# to a D open chord? I will be trying this out. This is a great lesson… the theory is explained, then what to do with it, then some easy ways to use it, some great examples and then.l… the highway is open.. Thanks Matt – this is such a good way to advance our blues playing. One last thing – now go listen to the great John Coltrane doing this stuff!!! This is a very interesting idea ! Especially when you break each chord down into it’s own statement, (or little solo) Example #3,appears to employ some quartal, where the comping is reminiscent of McCoy Tyner ! Very interesting. Tritone is the key for so many things. Um material espetacular, estou adorando tudo. Those lesson that you have been working on for years are just precious. Thank you guys for making it real!